• Certain vehicle conditions and the surrounding environment may affect the ability of the sensor to correctly detect obstacles. Particular instances where this may occur are listed below. • There is dirt, snow or ice on the sensor. • A sensor is frozen. • A sensor is covered in any way. • The vehicle is leaning considerably to one side. • On an extremely bumpy road, on an incline, on gravel, or on grass. • The vicinity of the vehicle is noisy due to vehicle horns, motorcycle engines, air brakes of large vehicles, or other loud noises producing ultrasonic waves. 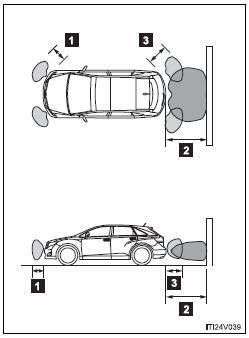 • There is another vehicle equipped with parking assist sensors in the vicinity. • A sensor is coated with a sheet of spray or heavy rain. • The vehicle is equipped with a fender pole or wireless antenna. • A bumper or sensor receives a strong impact. • The vehicle is approaching a tall or curved curb. • In harsh sunlight or intense cold weather. • A non-genuine Toyota suspension (lowered suspension etc.) is installed. In addition to the examples above, there are instances in which, because of their shapes, signs and other objects may be judged by the sensor to be closer than they are. • Wires, fences, ropes, etc. • Do not use the sensor at speeds in excess of 6 mph (10 km/h). • Do not attach any accessories within the sensor range.